While there isn’t a set time frame for when to repaint your home it is important to continuously assess the condition of your paint, looking for chips, cracking, peeling and flaking. Firstly, we know that a well-executed fresh paint job beautifies and freshens a home but most importantly paint is one of the primary protection agents for your home, defending it against the weather, insects and birds. And while there isn’t a set time frame for when to repaint your home it is important to continuously assess the condition of your paint, looking for chips, cracking, peeling and flaking. Climate: Where you live, the weather and the climate conditions your house is exposed to has a direct impact on how long your paint job will last. If you live in a location that is hot and dry, with minimal shade then it is likely that the sun will cause your house’s paint to fade and potentially bubble more quickly. On the other end of the spectrum, prolonged harsh winter conditions, snow, frequent storms and salty ocean breezes can also reduce the time in between paint jobs. Previous Paint Work: The quality of your previous paint job will be a major factor in how long in between each of your paint jobs. This includes the colour of the paint used (lighter paints generally last longer than darker ones), the quality, the number of coats applied (obviously 3 coats is better than 1) and what weather conditions the paint was applied in. If your house was not prepared properly then you can expect to be painting sooner rather than later. Upkeep: How you care for your home will also play a part in how long your paint lasts. Take care of rot, termites, bora, mould and dampness. Cleaning bird droppings and other dirt of your home frequently is also important. All of these things, if not addressed, deteriorate the integrity of the paint. It isn’t always obvious when it is time to paint, particularly if you have never had to re-paint a house before. 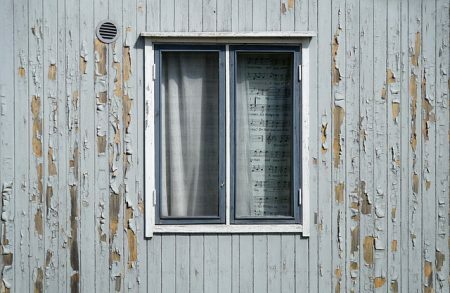 If you notice paint peeling or cracking then this is a good indication that your house needs some TLC. Failure to address cracking paint can allow moisture to get into wood and foundations, which is likely to cost you more than a new paint job. It is common for window and door frames to need re-painting more often than the rest of your house. On average wood siding should be painted every 3-7 years or stained every 4 years. Aluminium sided houses generally require painting every 5 years and stucco houses every 6 years. Newer materials such as cement fibreboard only needs repainting every 10-15 year and painted brick should last up to 20 years. Cedar, which is stained rather than painted, requires more frequent care every 1-2 years. Be sure to consider your exterior cladding and its upkeep if building new. Other than protecting the integrity of your home there are some other benefits to painting your home. Painting your house can be a cost-effective way to increase the value of your home if you are planning to sell, this goes for both the exterior and interior of the home. A fresh coat or two is a cost-effective way of giving your home a makeover without the cost of renovating. Inside, repainting walls (in particular plaster walls), helps to keep dust and dirt to a minimum and can cover stubborn marks and stains. Time to get painting!